I'm pleased to announce to Applause Ticket News readers that singing sensation (4 multi-platinum selling albums), songwriter, actor and record producer Josh Groban (35 years old), will make his Broadway debut playing in the role of Pierre, a high society aristocrat, old fashioned Russian and Denee Benton will play the role of Natasha in The Great Comet at New York's Imperial Theatre. I saw this show, which was playing Off Broadway in a pop-up venue in the Meatpacking District of New York City in the summer of 2013. It was set up like a Russian dinner cabaret including drinks and food being served during the performance, something I'm sure that will not take place in a large Broadway Theater like the Imperial Theatre for sure. Although I'm quite sure you'll be able to buy some food and drink during intermission of this show, so not to worry. The show, called Natasha, Pierre and The Great Comet of 1812, which is based on Leo Tolstoy's War & Peace (volume 2, Part 5), nearly 70 pages or so of his book. The time is 1812 before Napoleon invades Russia as the city is burning. It tells the story of Natasha who is newly engaged and Anatole who are having an affair. Friends and family members including Pierre, basically an upper class old fashioned Russian who dislikes the action of this brash young couple and although he ordinarily wouldn't necessary be bothered by their actions at this point in his life, now contemplates how he might intervene and put the couple on the right track to behave appropriately. This musical adaption of some of the story of Tolstoy's War & Peace is going to be a fantastic, extremely unique Broadway theatrical experience, unlike any other seen before in the history of Broadway. 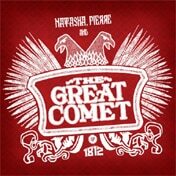 Natasha, Pierre and The Great Comet of 1812 has Music and Libretto written by Dave Malloy with excellent direction by Rachel Chavkin. The score includes nearly 30 songs and the show has 10 characters. The music is a unique blend of "electro-pop opera" which manages to merge Russian folk music with classical music at the same time. I thoroughly enjoyed it as it keeps the story moving at a very active pace. Charles Isherwood of The New York Times called it "a vibrant, transporting new musical". Time Out New York magazine gave it "five out of five stars". Some other critics gave the show outstanding reviews as well. Could you ask for anything more? I expect that Natasha, Pierre and The Great Comet of 1812 tickets will go on sale shortly. I have personally been getting lots of phone calls asking for tickets. Please call Applause Tickets if you are interested in seeing this show and we will take all your contact information then get back to you when tickets go on sale (which we expect to be soon). The Great Comet is already an anticipated hit show for the next 2016-2017 Broadway season, especially considering that Josh Groban will be starring in the show. Along with this season's blockbuster mega-hit Hamilton and some other fabulous Broadway shows, we expect the next several years to be exciting ones for the entire Broadway community. Cheers and best of luck to the The Great Comet. If you need assistance in obtaining Natasha, Pierre and The Great Comet of 1812 tickets we'd love to assist you, your friends and family. Kindly call us 24/7 for help. I hope you've found this blog post helpful. Check out our Facebook Page at Applause Theatre & Entertainment Service Inc.